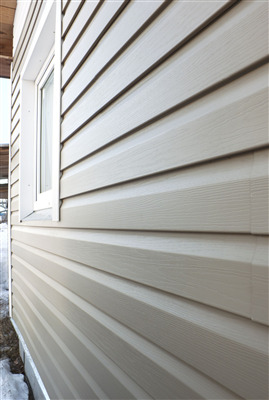 How we begin the process is by evaluating your siding. We see where the problem is and what other areas of your siding may be affected and plan a course of action. Finally, it's time to initiate the repair. We separate the damaged piece from the rest by using a specialized tool. Prior to running the tool along the siding, we insert a shim to hold the pieces apart. We do this process in sections for best results. The next step involves another special tool that cuts the vinyl siding. We then cut a patch to repair the siding from a new piece of vinyl. We make sure the path is slightly larger than the piece that was removed. Using a caulking made to adhere vinyl to other vinyl, we set the patch on top of the area with the issue. Lastly, we lock the siding into place where the original piece locked in. We take care of matching the color and style exactly or to as close as possible if the particular siding used on your house is no longer manufactured. We guarantee you won't be able to tell that the siding has been replaced due to our high-quality work and tools combined with our many years of expertise. You'll be thankful to pay someone when you think about how expensive it will be to repair the entire side of the vinyl siding after you repair it incorrectly. A fix executed improperly may damage the siding, and then the weather will enhance the problem even more. You don't want to cause problems to occur behind the siding because they makes the repair even more costly because it may cause issues with the construction of your home. If you notice a problem with your siding, contact the experts at Intelligent Design Corporation to correct it as soon as possible for the best results. Should You Replace Siding and Roofing at the Same Time?